Mother and I have been busy bees, cranking out four wreaths thus far and one more to go. There have been multiple trips to the craft stores because I can't ever seem to get the ratio of ribbon just right. Too much burlap, not enough deco mesh, etc. You know you're getting older when your shoulder and fingers are sore from crafting. Here is the wreath we made for our front gate. I'm digging the square shape. 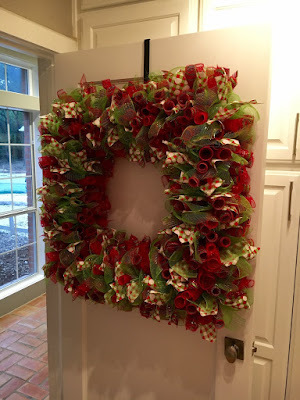 The last one I'm planning to make this holiday season is a smaller square one in the same red, white and lime green color scheme for the front door. This wreath was made for one of mother's oldest and dearest friends. 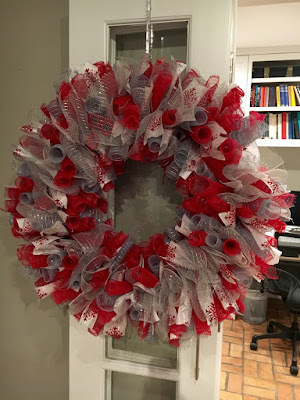 She chose the colors of red, white and silver and we did the rest. All it lacks is the red and white glitter 3-D picks I bought to use as accents. Last wreath we've completed is the small one we'll place on my granny's grave when we're back on our old stomping ground in a couple weekends to visit a couple of mother's old friends. 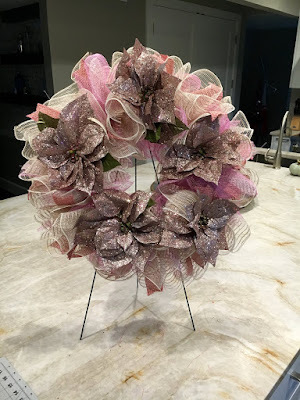 The sparkly pink poinsettias were our inspiration, so I chose the burlap to try and tone it down a bit so it isn't too Vegas for the cemetery. A friend asked if wreath making would be my second career. I told her only if I could outsource the actual work to a third world country. I enjoy the beginning when we pick out the design and colors, and then the end when it's finished. All of the cutting and measuring and twisting in between is a pain in the patootie.